The Jambo brush guard was a dealer-installed option. 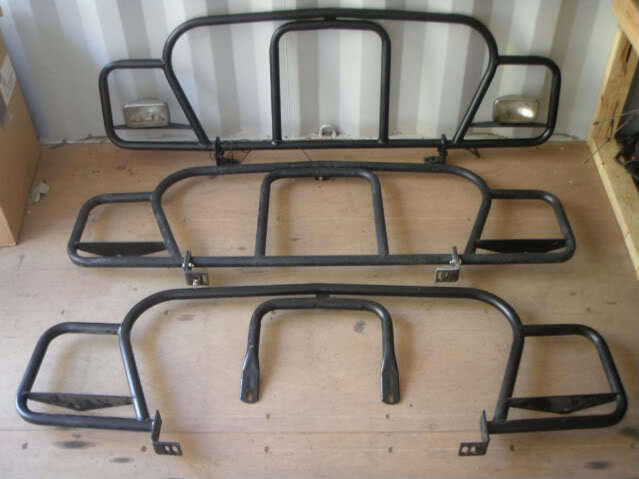 It is actually two pieces: the brush guard and the grille guard (described below). 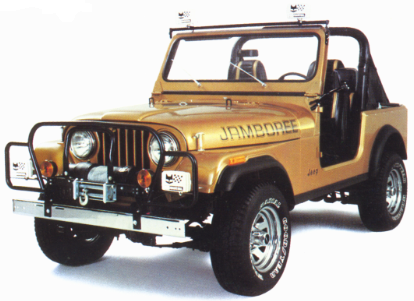 The grille guard is only the center section that is attached to the winch. The brush guard is the remainder. The center section can be changed out depending on whether or not you have a Ramsey winch, Warn winch, or no winch. 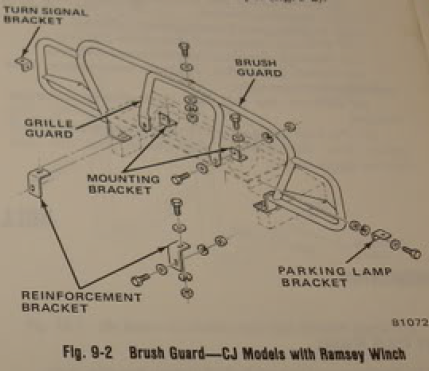 A schematic of the brush guard without a winch is shown to the right. The brush guard is everything but the middle grille guard. The part number for the brush guard is SE2073209. 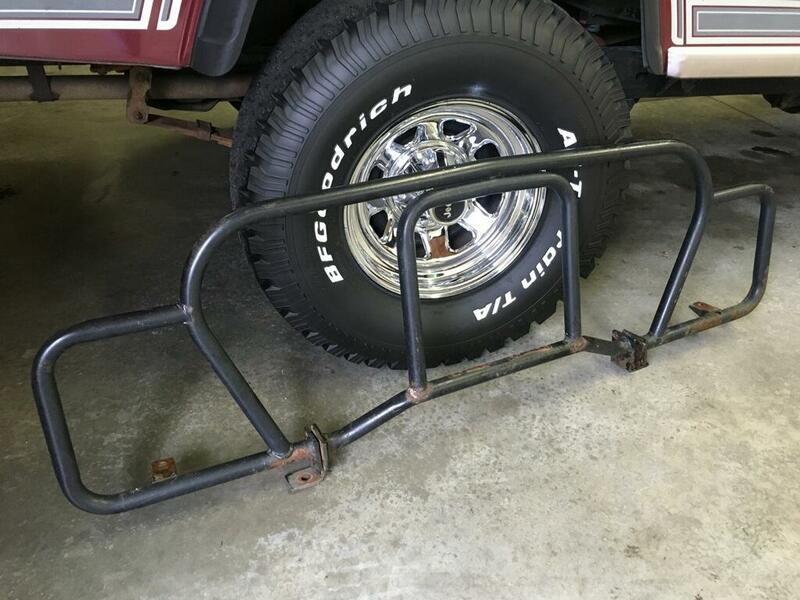 In order to install in the brush guard you also have to install the grille guard. The picture to the right shows the grille guard to be used without a winch (SE2073210). 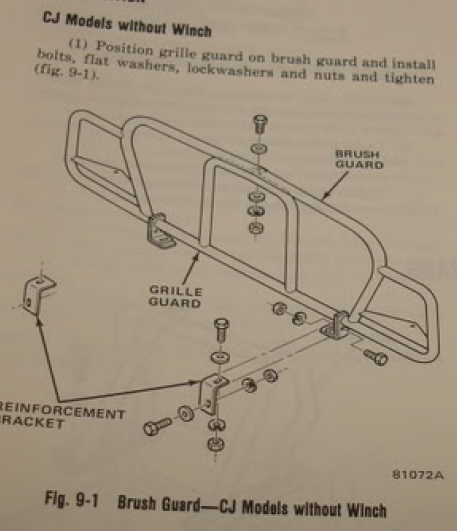 The picture below shows a grilled guard to be used with the Ramsey winch (SE2073212). 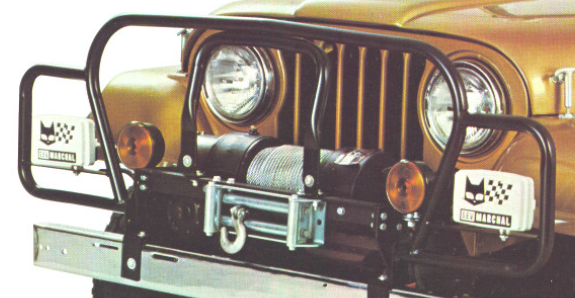 A grille guard for the Warn winch was also available (SE2073211). You need to be careful to find the correct brush guard. This particular design was also used for the YJs. The picture below shows three correct brush guards. The top two are for use without a winch. The bottom is for use with the Ramsey winch. Notice, the grille guard is only the small u-shaped guard. The rest of the center section is the winch mount. Notice that the mounting brackets point in towards the center. Also notice the triangular mounts for the Marchal fog lights. 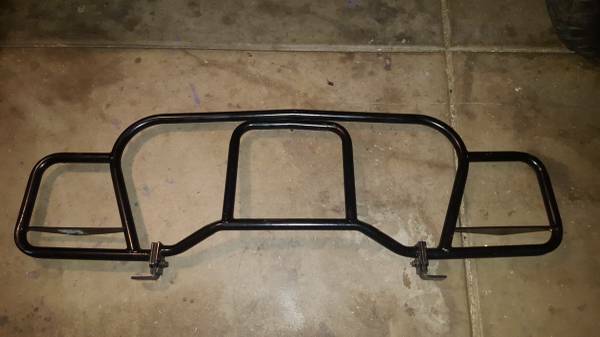 Here is a picture a brush/grille guard that is mistaken for the Jambo brush/grille guard. Notice that the grille guard is incorrect. This is a grille guard for a different winch setup. The brush guard is almost correct, except that the mounting brackets are incorrect. Here is a picture of another brush/grille guard that is also not correct. The grille guard is wrong, the mounting brackets are wrong, and this one is missing Marchal triangular mounts.